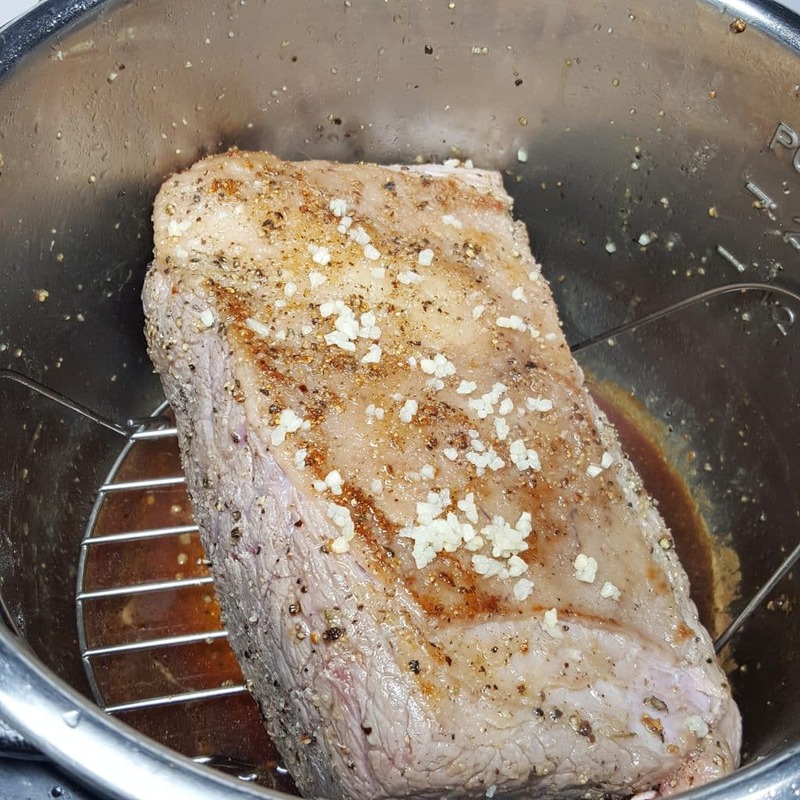 Instant Pot Rare Roast Beef with my fool proof method cooks in the Pressure Cooker to yield rare, tender and juicy, deli style slices for sandwiches. Naturally Low Carb, Keto, Whole 30, Slimming World, Weight Watchers, Paleo. Yes, folks, it can be done in an Instant Pot, Mealthy MultiPot or Pressure Cooker. Look how the Roast is pink, end to end!! This very Rare Roast Beef is perfect for sandwiches, salads and snacks. No need to ever buy pre-sliced Roast Beef from the Delicatessen ever again, right? Here’s what happened. Many people in my This Old Gal Facebook Group, have asked me to test out cooking a Roast Prime Rib in the Instant Pot, Mealthy MultiPot or Pressure Cooker. I have a fool proof method on how to cook a Perfect Roast Prime Rib using the Oven. My method for cooking a Perfect Roast Prime Rib outside on the Grill is pretty fabulous too. 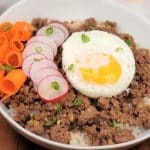 Can Eye of Round be Cooked in an Instant Pot or Pressure Cooker? Not wanting to ruin my favorite cut of Beef ever, I decided to start out with an Eye of Round Roast, which is a cheaper cut and great when cut thin, for Roast Beef Sandwiches. Very Rare Roast Beef Sandwiches are my thing, but buying Roast Beef from the Deli, is rather pricey and I only like very Rare Roast Beef! Start with an Eye of Round, top or bottom. All three cuts work! The shape is nice and you get an even ‘doneness’ throughout. For someone like me who only likes rare beef, this is perfect; I won’t eat well done meat. If you do like well done meat, the Eye of Round is also perfect, for the same reason. Kosher Salt – will help to break down proteins, which in turn will ensure a very juice piece of meat. Plastic Wrap – for wrapping the meat. As the salted and wrapped prepared beef roast should sit in the refrigerator overnight, this is a great prep a head recipe. It won’t taste salty after cooking; I promise. The salt is used to tenderize the roast. Whisk together the Olive Oil Rub. What is in the Olive Oil Rub? As always, these ingredients are just a suggestion and a flavor combo that I personally enjoy. Be creative and use whatever you normally like to use on a Roast. 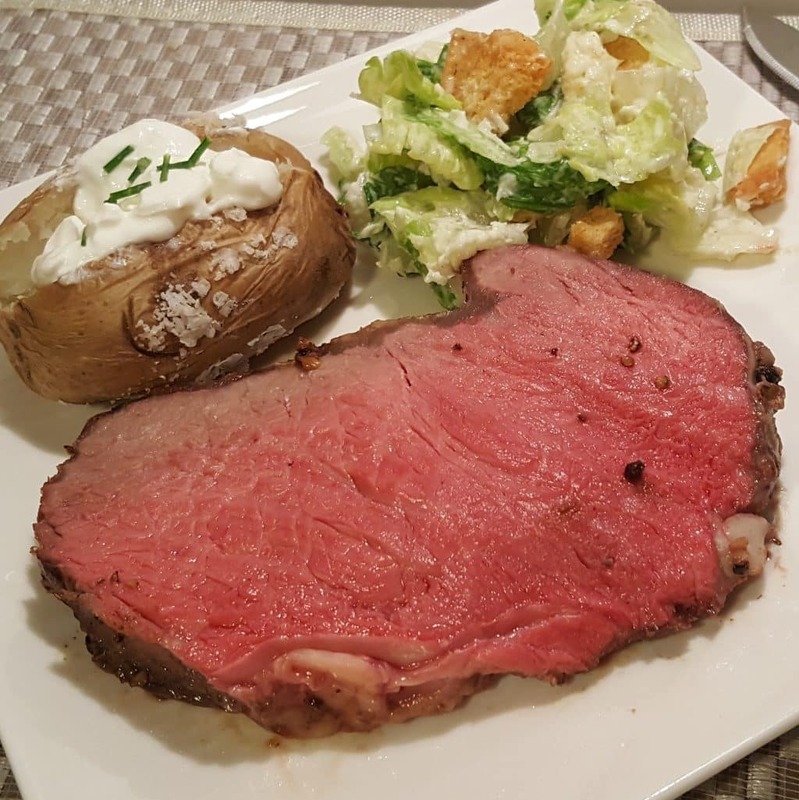 The purpose of this Recipe Post is to show you the very best method of cooking Instant Pot Rare Roast Beef deli style in your Instant Pot, Mealthy MultiPot or Pressure Cooker. 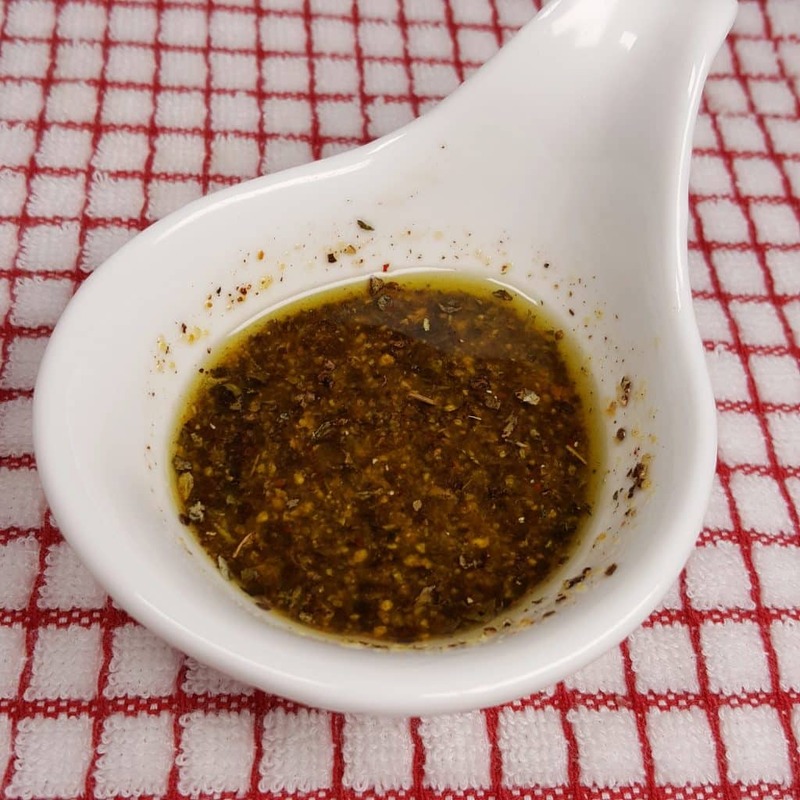 Montreal Steak Seasoning is killer to use on an Instant Pot Rare Roast Beef as well. Whichever flavor profile you choose, make sure to mix it with some Olive Oil for your custom Olive Oil Seasoned Rub. That being said, I hope you do try this recipe using my suggested ingredients. It really is fabulous. Once unwrapped, your tenderized piece of beef is ready for the Olive Oil Seasoned Rub. 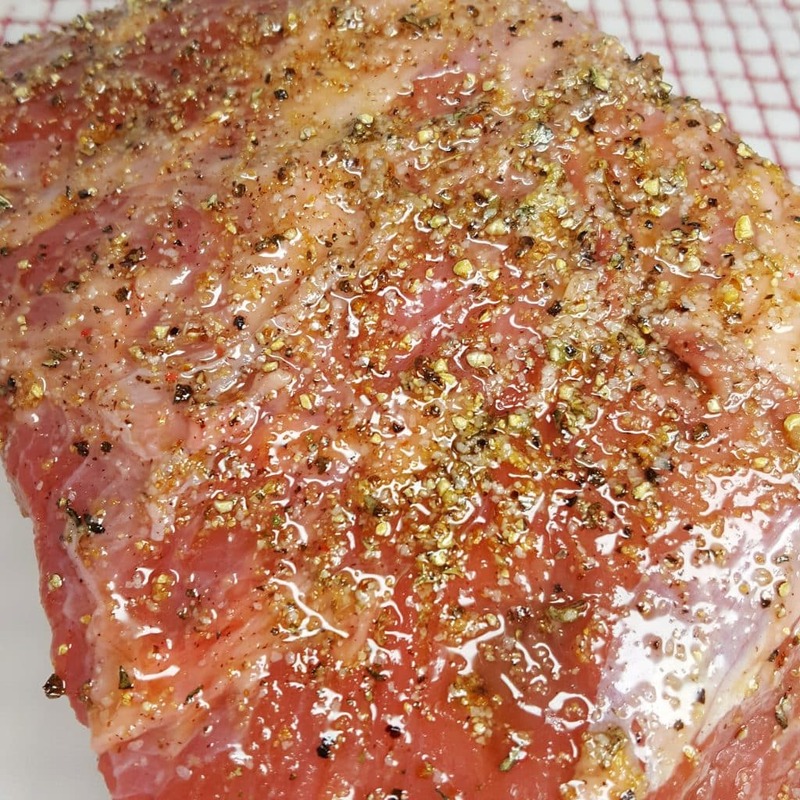 I like a Black Pepper Crust, so if you like Black Pepper, add more to the Olive Oil Seasoned Rub. I like to use a little scoop of the Beef Base rubbed on the meat prior to searing as a flavor enhancer. Check out my Pressure Cooker Salisbury Steak for the best flavor you have ever had! Before Searing your Instant Pot Rare Roast Beef, make sure to fully heat your Instant Pot, Mealthy MultiPot or Pressure Cooker. Start with the Fat Cap side into a very hot cooking pot. It is important to not over sear your beef! For multicookers like the Instant Pot, Mealthy MultiPot or Pressure Cooker the Saute or Browning button is used for browning and searing. For stand along Pressure Cookers or the Power Pressure Cooker XL, which do not have a saute or browning button, a preset button can be used in the same manner. OXO Stainless Steel Tongs are great to use as a second pair of hands, but I’ve been finding it easier to just use my hands as the beef is rather slippery. It is important not to over sear or brown the meat. The recipe card below has the full instructions. Add a dry red wine red wine or Shaoxing Wine is great for deglazing and will loosen and any stuck on bits. 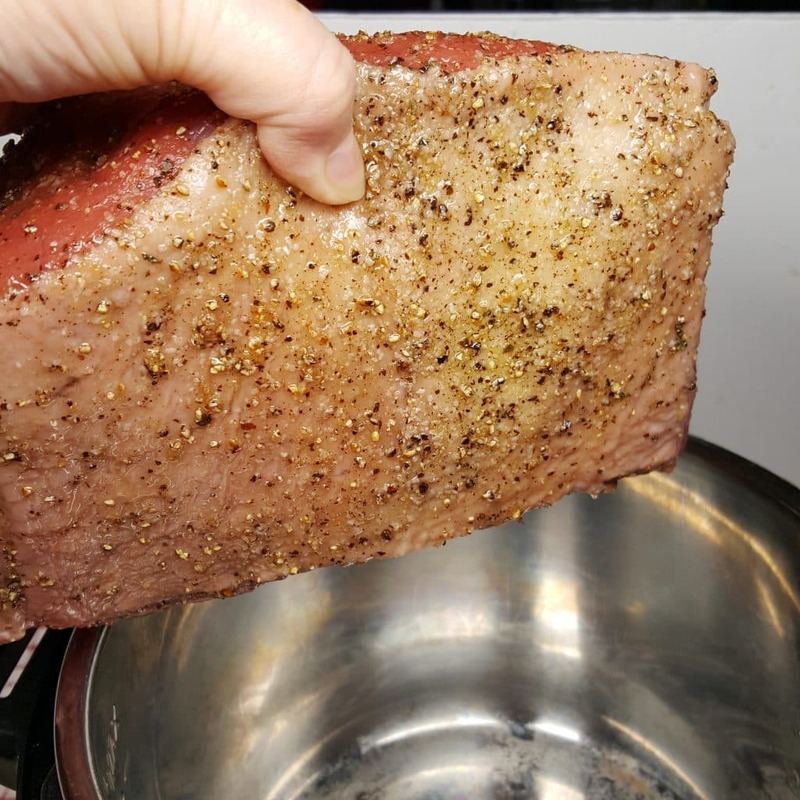 How to Make Flavorful Infusion for Instant Pot Rare Roast Beef . Dry Red Wine or Shaoxing Wine – This Chinese cooking liquid is far superior to any “cooking wine.” Cooking wine is never recommended. Shaoxing seems to work in the same manner as dry red wine and gives just as delicious flavor profile. Plus, it is much less expensive. Country Bob’s Marinade is another flavor profile option. The meat can be marinated overnight and then prepared in the same manner. It is truly delicious and highly recommended. Please note: the directions and ingredients to this recipe have changed a bit from the original, so some photos will not match up exactly. For instance, I used mostly White Wine, added whole Garlic Cloves and a Bay Leaf prior to placing the Trivet. 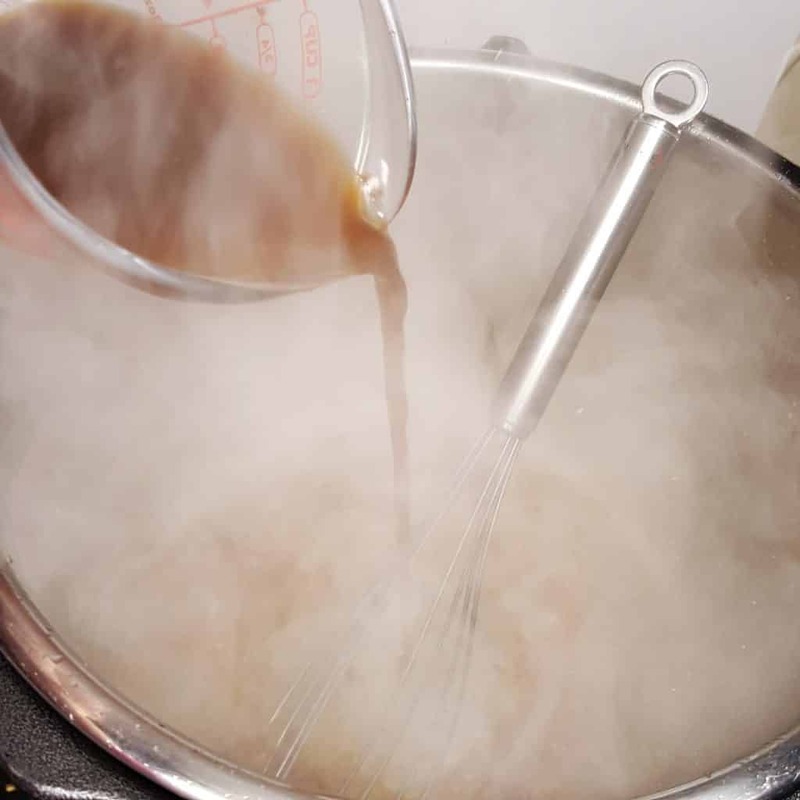 It is best to use a Stainless Steel Short Legged Trivet, so that the liquid in the bottom will easily come in contact with the Eye of Round, while cooking. If you do not have the one that came with your Instant Pot, Mealthy MultiPot or Pressure Cooker, I suggest this Stainless Steel Trivet Set. The garlic is best infused into the meat from the cooking liquid, as opposed to on top. If you have a second Instant Pot or Pressure Cooker, you might want to make a batch of my Instant Pot Potato Salad, to go along with this Instant Pot Rare Roast Beef. The Instant Pot Rare Roast Beef cooks slow and low. 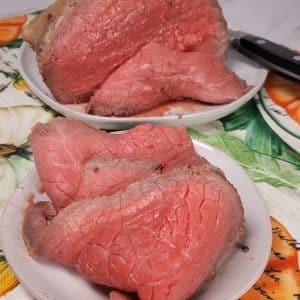 How to Cook Instant Pot Rare Roast Beef. One the meat is removed from the Instant Pot, Mealthy MultiPot or Pressure Cooker, it will continue to cook. Pressure Cooker Roast Beef should be removed when it is about 5-10 degrees less than your desired preference. You can see in the photo that we love very rare meat. In the recipe card below, you will find options to rare, medium rare and rare options. 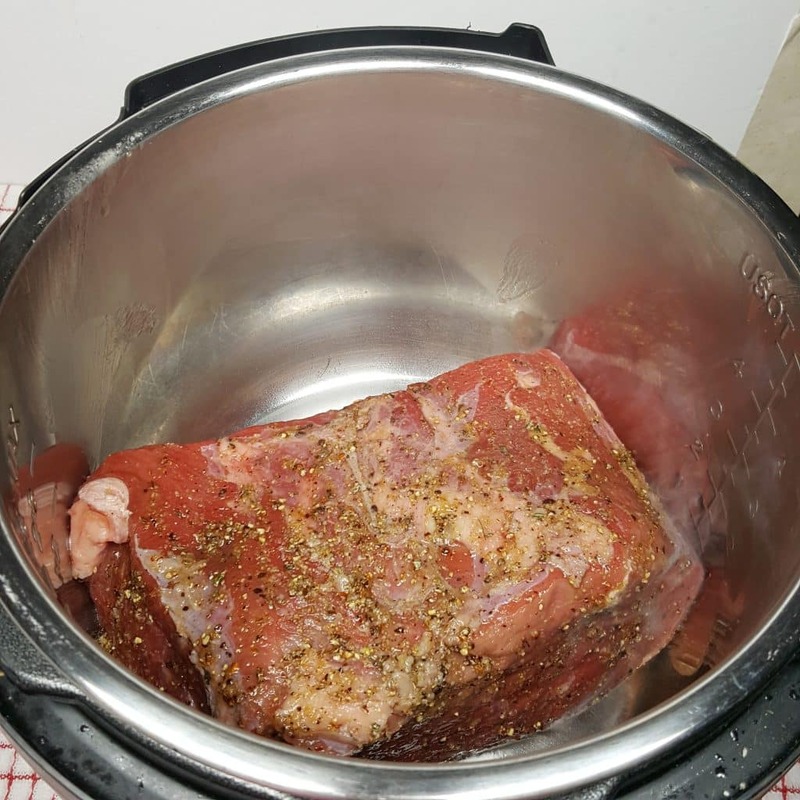 Remember, the Instant Pot Rare Roast Beef will continue to cook, after it has been removed from the Instant Pot, Mealthy MultiPot or Pressure Cooker. Before slicing the roast, cover it and let it rest for at least 15 minutes. The juices will redistribute throughout the Beef. 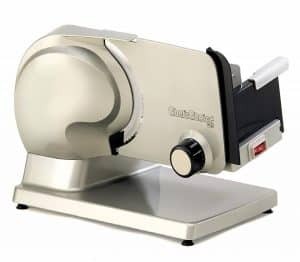 ****Update – since the posting of this recipe, we have made it many times and have since purchased a Chef’sChoice Food Slicer for a great price. We can now cut the Instant Pot Rare Roast Beef into paper thin slices!!! 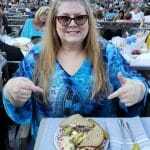 Below is a photo and here is the link to get the Slicer. Plus, since I make Homemade Hokkaido Sandwich Bread, every few weeks, we can use it to slice the bread too! In addition, for those of you who make my Instant Pot Yogurt Whey Dutch Oven Crusty Bread, the Chef’sChoice Food Slicer will slice your bread perfectly! More Instant Pot Beef Recipes to Make. *** One more update before getting to the recipe card. Get this Country Bob’s Steak Sauce now! It’s fabulous. Instructions for cooking are on the recipe card below. Coat the Eye of Round with Kosher Salt and seal in plastic wrap. Place in refrigerator for at least an hour or up to 24 hours. Whisk together Rub ingredients of your choice. Remove Beef from plastic wrap and massage into Beef. Select Saute/Browning on Pressure cooker and allow to fully heat. Place Beef into cooking pot fat cap side down and sear for 20 seconds. Turn and sear each side for NOT MORE THAN 5 seconds and remove Roast to a plate. Pour Dry Sherry or Shaoxing Wine into cooking pot. Add Beef Base, Water, Garlic Cloves and Bay Leaf. Place short legged Trivet into cooking pot and place Roast on top. Lock on Lid and close Pressure Valve. Cook at Low Pressure for 4 minutes. * When Beep sounds, wait 35 minutes (pot should remain on Keep Warm). Quickly remove and check temperature. If Roast is not at 115-120 degrees (rare), replace Lid and let set for another 8 minutes until desired temperature is reached. For Medium Rare, temperature should be 125 degrees. Remove Roast from cooking pot and cover with foil for at 15-20 minutes before slicing. For optimal results, place in refrigerator overnight before slicing. Slice paper thin and use for sandwiches. Cooking time is for a 3 pound Eye of Round Roast or Bottom Round. Add 10 minutes of "Keep Warm" time for every 1/2 pound of roast weight. If the Roast is a longer, but narrower piece, you might want to start checking the temperature at 40 minutes. The Roast will continue to cook as it rests. Set pressure cook time for 2 minutes High Pressure. All other instructions are the same. Place beef into baggie, along with Country Bob's and marinate in refrigerator overnight. When ready to cook, remove beef from marinade and place on a plate, reserving the marinade. Coat beef in Kosher salt while the pot heats. Sear beef on all sides (as per recipe) and then remove from pot. Add reserved marinade, Shaoxing Wine, water and garlic into the pot. If you cut the Roast Beef right away, much of the juice will pour right out. Make sure to use a very good quality Chef's Knife that is very sharp. We sharpen our Henckels Knives with this J.A. Henckels International Fine Edge Pro 9-Inch Honing Steel. Serve it on my incredible soft and delicious Hokkaido Milk Sandwich Loaf or my Country Artisan Sourdough Bread, both of which are Sourdough and many people who feel they are Gluten Intolerant can digest without issue. If you have some Whey leftover from my Instant Pot Greek Yogurt Recipe, use it to make some Instant Pot Yogurt Whey Dutch Oven Crusty Bread. Toss in some Dried Rosemary and Sun Dried Tomatoes for a very flavorful Loaf of Bread. Hint, you can just use Fresh Water for that recipe too. PIN this Pressure Cooker Roast Beef! Hello. I am new to your site but I’m enjoying it already. Thank you for a clear detailed recipe, especially about how long to cook on “keep warm” per pound. I prepare eye of round quite often but never in PC…looking forward to trying this method. And I agree it you that it must be rare…120 is perfect. Question: How do you slice your roast so thin? I have trouble with this and would enjoy any suggestions. I do have a wonderful meat carving knife that does a pretty good job, but have thought about purchasing a meat slicing machine. Also do you freeze a portion of your cooked beef, and if so, is it sliced or whole piece when you freeze it? I usually leave the leftover roast in the fridge til the next day and then slice it. The key is to have a very sharp knife. Also I have a cheap slicing machine. It has never worked well for anything. The good ones are pricey and probably not worth it. I was wondering the same thing. My husband used an electric knife and it didn’t get thin enough and so was chewy. We need a good knife! Well I finally made your recipe today ( got put on hold due to circumstances beyond my control) and this is what happened. Followed your directions but it took almost about 50 minutes on keep warm to come to temp. I’m thinking because I’m at altitude, dry & cold that I should have increased PC time from 4 to 5 minutes. I will try it next time because I assure you this is how I will cook roast beef from now on. Also I did purchase the meat slicer awhile back mostly for jerkey…it’s a great tool for the kitchen. I used Montreal smoke seasoning and also added some liquid smoke to the liquid in the pot. We love smoke taste in our beef. Thank you again for developing this recipe. I’ve read to increase cooking time 15% for high altitude. I’m so glad to see this and can’t wait to try! Question: Why fish sauce? Does the roast have an Asian flavor?It’s a little unexpected. Thanks! Made this last night and it came out perfect – better than the last oven roast I made. This is a keeper! Jill, I’m kind of heart broken. 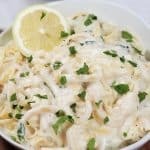 I love your recipes and especially this one! 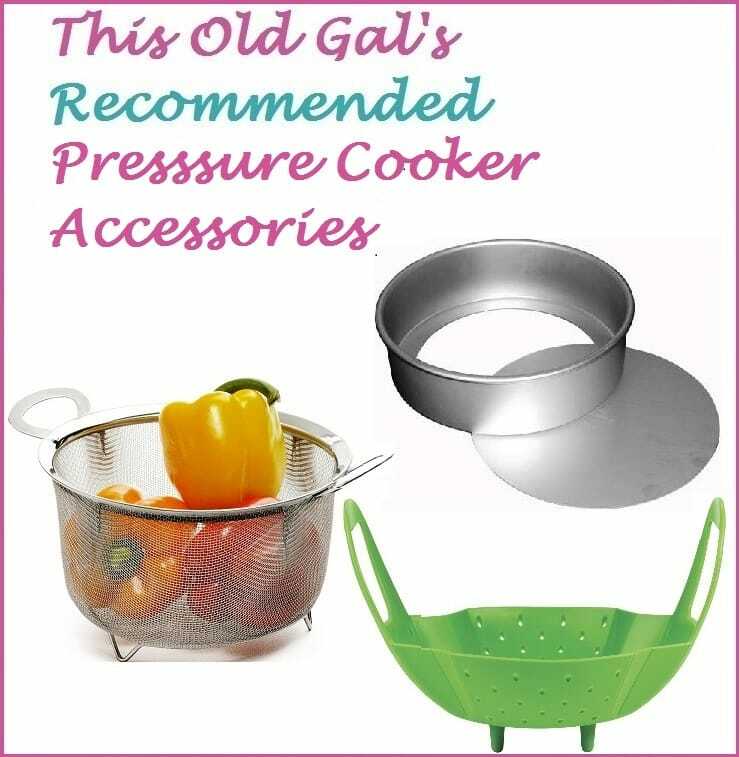 Unfortunately, I do not own an Instant Pot brand pressure cooker and I have no option on mine for low or high pressure. I think it’s always on high. Can you please tell me how I might be able to do this under those circumstances? The rice setting is usually low pressure and may work. 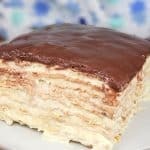 You posted so many fabulous sounding recipes. I’d love to try more of them. Thanks for your ingenious recipes. Great recipe and tis will be my third time doing it. First time was the day BEFORE your revision was posted and my roast was medium well after 80 minutes…edible but NOT what i was shooting for…2nd attempt was after the revision and i stuck the thermometer after 60 minutes and the temp was already 132º, so now THS time I’ll jump in after 50 minutes and see where I am. Trust me, I’m following directions to a T…so very grateful for ALL your recipes, and I’m thinking I may just have a HOT IP! 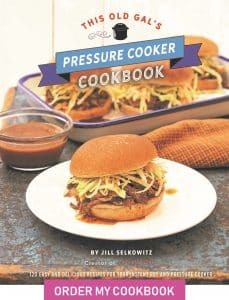 Hi Jill-Am looking forward to trying your beef recipe. But, because we cannot have any alcohol, can you suggest a substitute I can use in place of the wine? I prepared an eye of the round roast exactly per your directions (before revision) and it came out perfectly. A great way to have roast beef slices for sandwiches without the high prices at the deli. Next time I will be using some Montreal Steak seasoning as you suggest. Great recipe! This was so good! 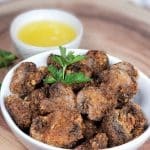 Very tender and tasty, and so easy to make! I used a 3# eye of the round, and followed the directions. Keep warm time of 60 minutes and it was PERFECT! Hi Kim, I have 1.5 lb eye round of beef. Your recipe calls for a 3-5 lb beef. Should I lower the cooking time? If so, by how much? Thanks! This turned out exactly like the photo! We had a steak and feta salad for dinner, and tomorrow my husband will have amazing roast beef sandwiches. This is a lean cut of meat and perfect for sandwiches. I cut it very thin on my meat slicer. The juice left behind was a little salty, but I think it would have flavored the meat wonderfully if I had tossed all of the sliced meat in it. I made this tonight. Wow ! It was delicious. I only used Montreal steak spice and let it marinate for 1 hour . Boullon in the bottom of the instant pot .Garlic on top of the roast. I browned my roast on saute setting and then cooked on low pressure for 6 minutes. My roast was partially frozen. I took it out at 60 minutes @ 120′ and let it rest for 15-20 . Amazing! I am thrilled. I actually tried this because I had just cleaned my oven yesterday and did not want to dirty it !! Thanks for a great recipe! This came out ever so perfect . I am new to the Instant Pot and am just learning how versatile it is. I made an eye of round yesterday for dinner and was ecstatic at the results — rare roast beef! My husband and grandson loved it. It was tasty and tender. Sadly, I do not have a meat slicer to shave the leftovers for sandwiches, but that may be a purchase in the near future. Thank you for this fool proof recipe! I have a question. I purchased a small 2.1 lb eye of round to make a different IP recipe that called for slicing the beef 2” thick before cooking it in the instant pot. Before freezing my small roast, I cut it in half—unfortunately! I I longer want to try that recipe that will cook the meat very well done for shredding. Instead, I want to try your recipe for RARE roast beef. Do you think I can still do it , even though it it cut into 2 halves? And what time would you suggest since it’s just slightly over 2 lb? I’m on of those people that can not stomach any pink in meat. It has to be well done. Can you give me an idea of how to cook this in an Instant Pot for well done? Can this be done with a turkey breast for Deli style lunch meat? I did the roast beef and it turned out perfect. Love saving all that money by not buying expensive deli meat. I’ve found how to cook a turkey breast but those seem to be for a family dinner not for thin slicing. The turkey I cook doesn’t stay together like deli sliced meat. Is there a technique for the IP? Made this for the first time tonight with a top round roast I found reduced for quick sale and stuck in the freezer some time ago. I wasn’t sure what to do with it so I Googled around and found this recipe. It came out really well and all my picky children gobbled it up! I made five pounds and it smelled so good that we had some hot for dinner and are looking forward to eating it chilled and sliced on sandwiches tomorrow. 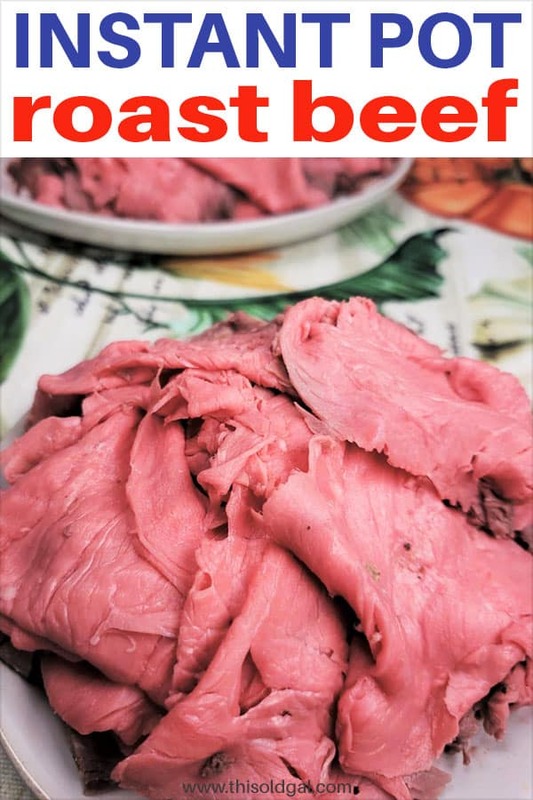 Having only recently found an OVEN method for successful pink roast beef to turn into thinly sliced deli meat, THIS Instant Pot recipe is PURE ease and so economical. 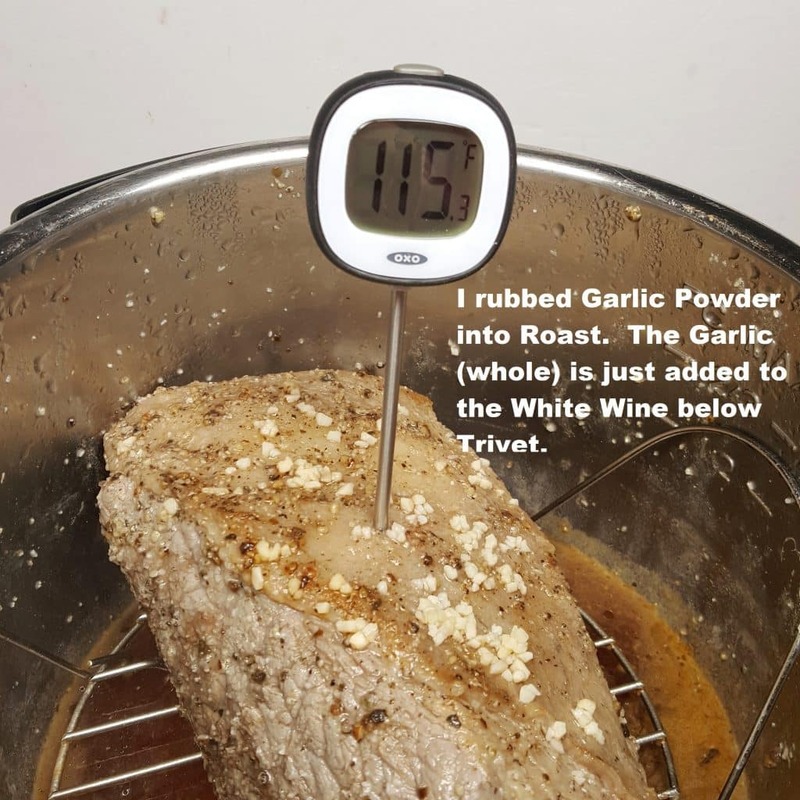 I had found a 3 lb spoon roast (ball tip roast from bottom sirloin) and was thinking about doing the oven method from Bob & Shan’s blog…that would work very well if you want to use TOG’s recipe but only have an oven to work with. 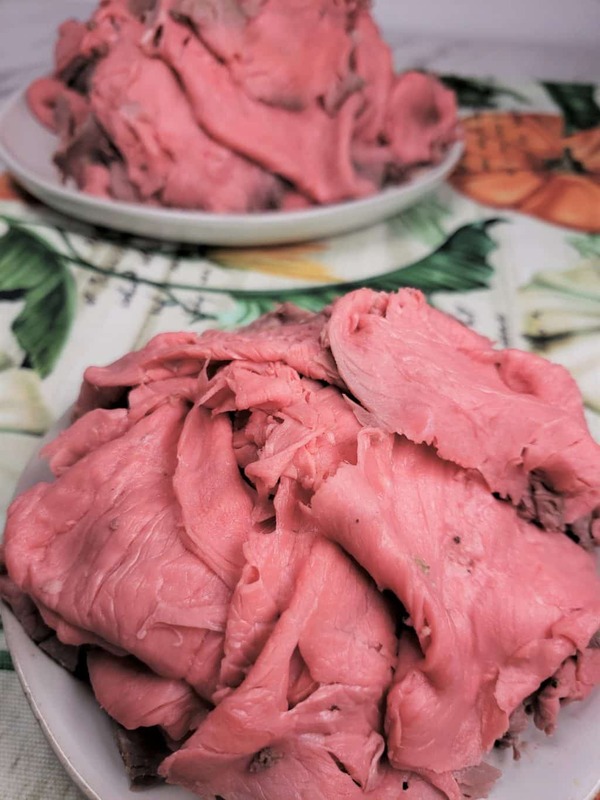 However, I PREFER to make use of my instant pot, especially in summer and while we did eat the meat for dinner tonight, thinly sliced with prepared horseradish in whipped cream, I’m MOST excited to have the edge to edge pink deli beef. I am so happy, and thank you immensely. BTW, I have the exact same Chef’s Choice Food Slicer. It’s affordable and works very well. I usually put my meat in the freezer for 20 minutes to get it super cold and firm before slicing it on the Food Slicer if I want super thin slices. And, if you are slicing by hand, it IS possible, but you need an ULTRA sharp knife, PATIENCE to take your time with the slicing, and I also recommend that for DELI meat, you refrigerate overnight, then put it in the freezer for 20-30 minutes and then do your hand slicing. It’s a labor of love, but with This Old Gal’s method here, I plan to have more and more roast beef for salads, keto wraps and Philly this and thats. Can you do this without the wine? I have had this slicer for a couple of years and it is very reliable. I love it. Question, after 4 minuets, do you release the pressure ? I’m unsure of how this all works. I have this same question. I’ve read and re-read the recipe card and I don’t see anywhere that says when to release the pressure. Release it as soon as the 4 minutes are up, or after it sits on “keep warm” for the 60-80 minutes? As a relatively new instant pot owner, I’m still learning exactly how it all works. Yes, I made this and it did turn out as promised, but I made gravy with the drippings. OMG, soooo salty. After you unwrap it from the plastic wrap, should I have washed the roast before putting on the oil and seasonings? I just left out the house seasoning and used reduced-sodium beef base and it wasn’t too salty! This was the first recipe I’ve tried in my brand new Instant Pot! The flavor was excellent, but part of the roast (like a quarter of the way down from the top) has a very mushy texture–just like liver. The rest of the roast has a good texture. Would you please help me figure out what I did wrong? I used a three pound top round roast. I followed the recipe directions, but used enough broth to bring the liquid to 2 cups because I have an 8 qt Ultra. The liquid was still below the level of the rack. After an hour on keep warm, the temp was 125 degrees F, so I took it out. Our plan was to have some dinner slices and then cut the rest into thin sandwich slices, so I sliced into it after 15 minutes. Loved the color, although rarer would have been great. Do you have any ideas on what I could do different next time? We do love rare meat, but not mushy meat! I suggest following the directions. Thanks for your response. I’m a new user, so I was reluctant to use less liquid than the Instant Pot directions indicated. For the 8-qt pot, they say 2 cups minimum. I just came back to share that I tried this again after getting advice from the Instant Pot live contact us button. The agent said after the pressure cooking time is up, release the steam for a minute, then close the steam vent and continue as directed. This worked for me! The roast had the right texture along with the great flavor. Thanks for the recipe. That is not good advice for this recipe. I imagine the phone people really are not experts on recipes. This seems like a rather rude response to one of your followers who managed to have good luck with your recipe after speaking with the IP customer service team. I can’t imagine she will continue to visit your site after your terse and snarky replies. How do you “keep warm” on a stove top pressure cooker? I’m new to using it. After the 4 minuets of gently rocking what do I do? I followed Jill’s directions and my roast beef came out perfect twice. If you leave it browning more than the instructed 10 seconds it will cook too deep. I left mine on low pressure the 4 minutes, then sat for 60 minutes. Temperature in the center was 118 F Perfectly rare, tender, juicy, amazing flavor. I admin an Instant Pot cooking group and Jill’s recipes are very well tested. I trust them all. Great Job Jill! Can this be done with an eye roast that is frozen? I tried this last night and it come out pretty well. My Dad mention it tasted like deli meat from the old days and said most of the supermarket deli roast beef doesn’t have much flavor in it. That got me curious, what type of beef do supermarket use to made roast beef? Also most supermarket nowsday buy pre made one like Sara lee. Do company use lesser quaoity meat than before? Do you think a sirloin tip roast would work for this? This is the most confusing recipe I have ever tried to copy. And I am still not sure. Is is wrapped in salt? Is it wrapped with oil or not? 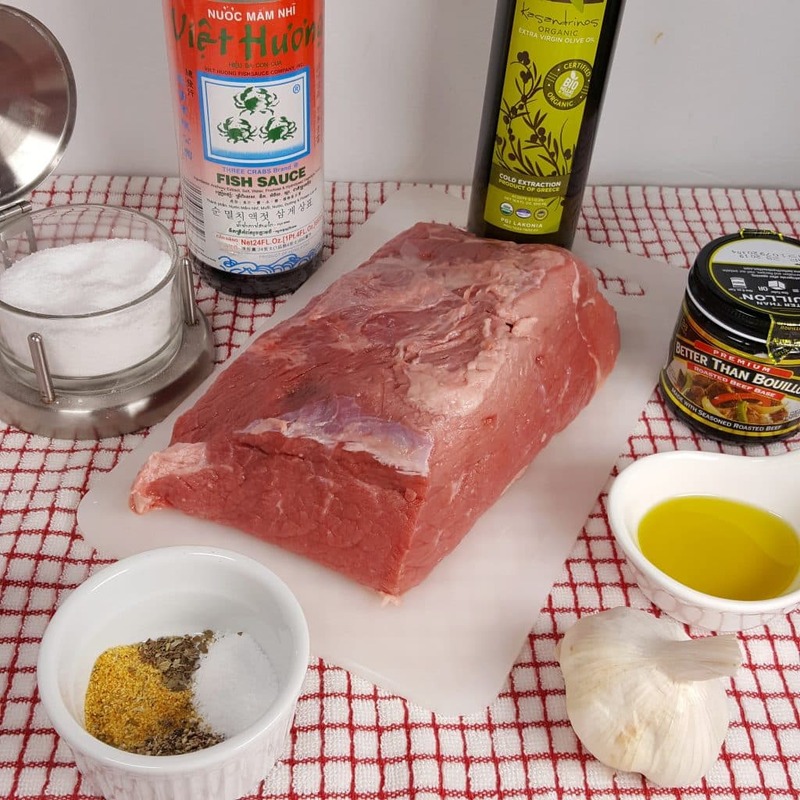 Bob’s marinade or Montreal steak seasoning. I have written and the more i read the more it changes. I dont know what to make of this. And my daughter loves rare meat so I am trying to make the right recipe. Omg this is not fair. I love you but this is going to give me a stroke. What is the rub, when is it put on? When is the winw used before or after browni g. I gave up after thst. Help. Brilliant recipe. 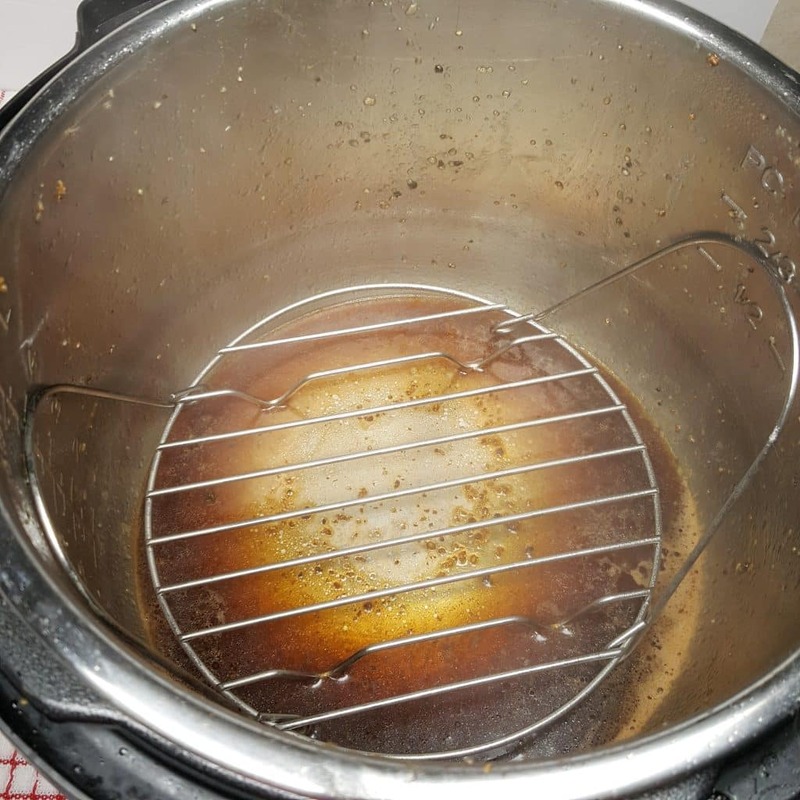 I have had my IP LUX 6 qt for about a month, and this was my first attempt at a roast. I used Montreal Steak Seasoning as I had it on hand. The Shaoxing wine was the real key, though. Kudos for coming up with the idea; much, much better than red wine. Also, you couldn’t be more correct on the uselessness and/or sheer misinformation provided by the IP maker. It doesn’t take a degree in advanced thermodynamics to question cooking a 3 lb. eye of round at high pressure for 30 minutes. The result would have the taste and texture of a lacrosse ball. Looking forward to trying more of your recipes. Keep warm – is it on low , medium or high setting? My instant pot has Keep Warm mode with this settings..
Made this recipe twice and it just gets better. Please follow the recipe exactly and use a meat thermometer if you want to be sure. Thank you so much for this recipe and the inspiration to make up my own rub. Had forgotten about salting the beef ahead of time but is well worth the planning ahead. Have used this recipe several times already since getting instant pot in July, thanks. WOW! Delicious. I made this last night. This is definitely something I will be making again. Followed the instructions as given and it turned out exactly like the pictures. The flavour was amazing, the meat was juicy and tender. Thank you for sharing! All I can say is “WOW”!!!! This is a fantastic recipe & the end result is delicious. Thank you for posting it. This was my first time making it using a pressure cooker and it came out great. Once I understood all the details of the recipe, it all made sense and worked flawlessly. This will become a staple recipe when only a great roast beef will do. Thanks again. How would this be for prime rib roast? Truly amazing. I cooked mine medium rare, but this had incredible flavor. Used Sherry and fish sauce. Used Canadian steak seasoning in place of TOG. After I chilled it in the frig, I sliced it with my Waring food slicer to get really thin. The ingredients call for a 4 lb roast but in the notes you refer to a 3 lb roast with an extra 10 minutes per 1/2 lb. Therefore, is the keep warm time in the directions for the 3 lb. or the 4 lb.? Also if, for the 4 lb., would you subtract 20 minutes if you were cooking a 3 lb.? Will this work if the roast is frozen or do you have to thaw the beef first? First, thank you for this excellent recipe. Never knew how to get something so good out of an eye of round. Next, something to share: While I use both Shaoxing wine and fish sauce regularly (heck, fish sauce in just about everything for that umami boost), a while back I was out of any type of stock and rather water, used a four dollar bottle of Dry Vermouth from Trader Joe’s. The spice profile of the vermouth combined with everything I was cooking was delightful. I’ve since used both the dry and the sweet as the occasion called in many dishes and I recommend you, Jill, and any of your readers giving it a try to see if it works for you. It combined nicely here. Thanks again. Great site. I am planning on trying this recipe with au jus sauce as the base. How many cups would you suggest for a 3 lb. roast? Great recipe. First time I ha e been able to make a roast to come out perfect.